White and porous sphere, insoluble in water and alcohol, non toxic, tasteless, odorless and no powdering and soften in water and alkaline solutions. Defluorination Activated Alumina for defluorination and arsenic removal is adsorbent used to adsorb fluoride and arsenic in the water. Fluorine is one of the trace element necessary for animal and human. Adult normal daily intake should be 2~3 mg, too much or too little can lead to disease, so defluorination is important in drinking water. 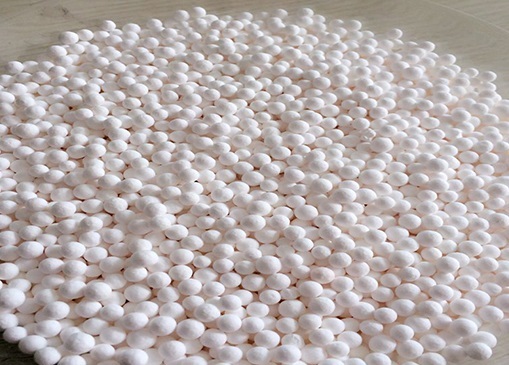 Activated alumina has good strength, good abrasion resistance, long service life, stable performance, high defluorination capacity, after defluorination the water quality accords with national health standards, so activated alumina is one of the indispensable material in water treatment. Defluorination Activated Alumina filters can reduce fluoride concentrations to below .1 ppm, or down to 99% of the normal fluoridated water level. The defluornation capacity of Defluorination Activated Alumina ball could reach 5mg/h. And it can be regenerated after heated in the temperature about 175°c to 315°c to removing water once it's reached saturation. Activated alumina defluorinating agent has amphoteric adsorption properties, by regulating the PH value of aqueous solution, anions in aqueous solution can be detached. Defluorinating equipment is similar to ion exchanger, in order to obtain high defluorination capacity, need to lower PH value, while the PH value is 5.5, activated alumina adsorption rate of fluorine is the largest. In order to meet the quality requirement and control corrosion, PH values should be slightly acidic. Activated alumina defluorination is similar to the anion exchange resin, but the selectivity for fluoride ion is larger than the anion resin. Smaller particle size can increase specific surface area, make a fully contact between activated alumina and water. For example, commonly used 1-3 mm, 0.4-1.2 mm, their specific surface area are generally more than 320 m2/g. High specific surface area means huge number of micropore, it can ensure a strong adsorption of fluoride ion in water. Avoid moisture, avoid scrolling, throw and sharp shocking during transportation, rainproof facilities should be readied. The product as desiccant cannot be exposed in the open air and should be stored in dry and ventilated warehouse to prevent contamination or moisture.